Generalized pain underneath the metatarsals. Patients will complain of pain or tenderness on the plantar surface of the foot in the metatarsal area and/or diffused pain in the metatarsal joints. 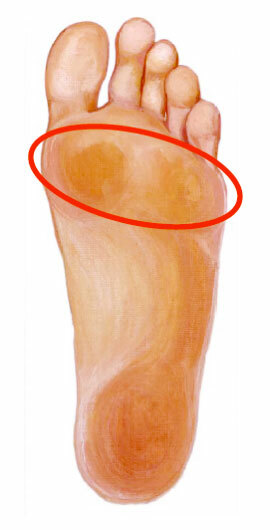 The condition Metatarsalgia is very common and the cause is abnormal weight distribution due to abnormal pronation. Orthotics should be worn to correct abnormal pronation and redistribute the weight more evenly along the plantar surface. If shoe fit allows, a metatarsal bar will assist by off-loading the metatarsal heads, alleviating pain localized under the metatarsal heads.